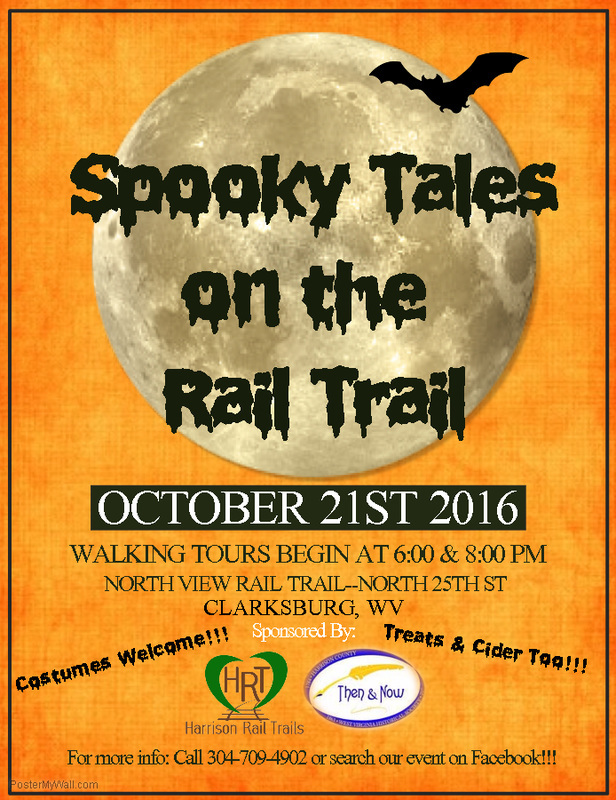 Join the Harrison County WV Historical Society and the Harrison Rail Trails for our 3rd "Spooky Tales on the Rail Trails"! For a Spooky fun time, meet us on October 13th for an evening of creepy stories and a stroll along the Harrison South Rail-Trail! We will meet at the Rail-Trail head by the ball field entrance at the Veterans Memorial Park. Wear your favorite costume and join us to celebrate the fall season, WV spooky tales, and a stroll along the Harrison Rail-Trails! Thank you to the Clarksburg Convention and Visitors Bureau for sponsoring this event! ​ On Saturday, September 1, at 3:00 p.m. at Waldomore, the Harrison County West Virginia Historical Society will present an address by Joel Strangis, of Durham, NC, entitled “Pasquale, Where Are You.” The address will recount Strangis’ efforts to locate the remains of Pasquale Bilotta, an Italian immigrant killed in Clarksburg in February 1931. 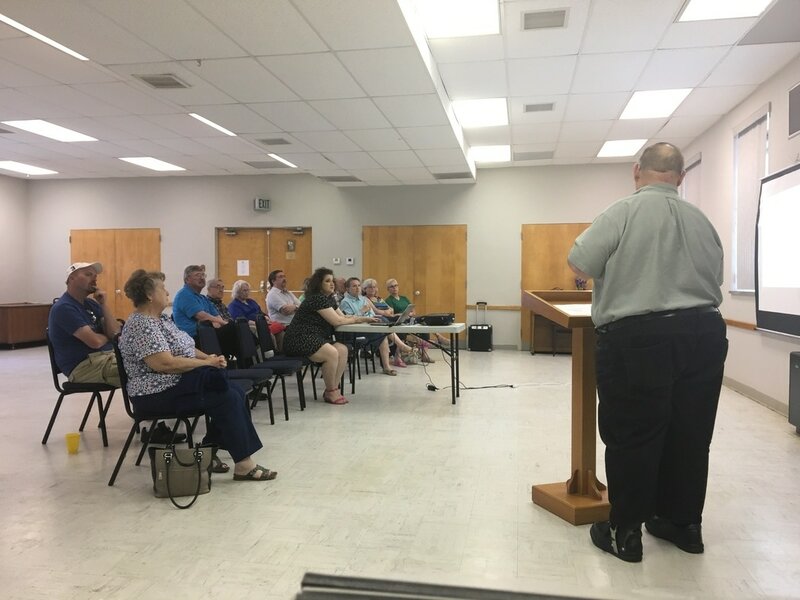 During his presentation, he will talk about Pasquale’s life as an Italian immigrant as well as the family and the town he came from; give background information on the murder case and trial; and describe his efforts to locate Bilotta’s grave in Holy Cross Cemetery. For any questions please contact the Historical Society at 304-709-4902. ​Come join The Harrison County WV Historical Society for an afternoon of fun and win one of our Vera Bradley Gift prizes! We will also have raffles, 50/50, and more! You'll also be able to purchase refreshments. 20 games for $20. Proceeds will go toward our archival supplied and house repairs. Doors open at 1 and games start at the Harrison County Senior Citizen Center. You may order tickets by emailing us at hcwvhs@gmail.com or by calling 304-709-4902. 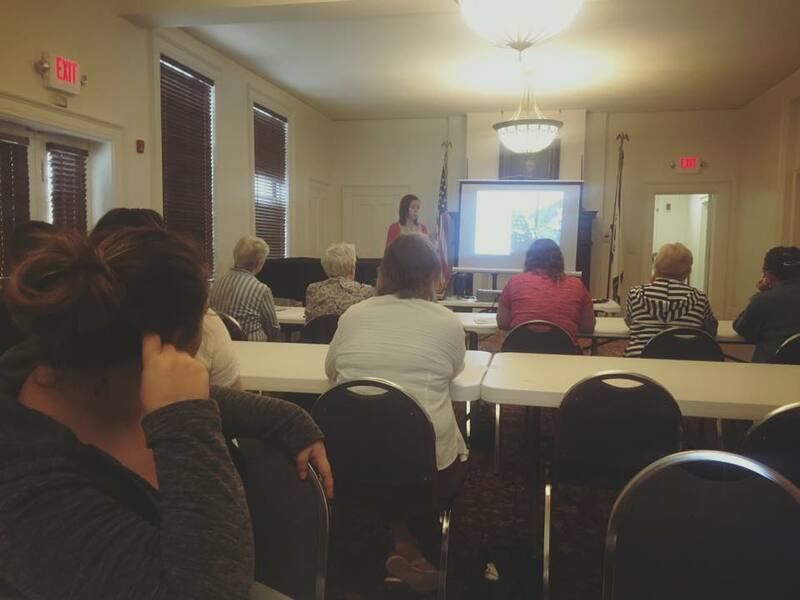 Join the Harrison County WV Historical Society's Executive Director Crystal Wimer she explores the best ways to begin your genealogical research and discovering your family history. She will discuss resources available both locally and online. She will also have tips and tricks from local genealogical researchers. The workshop has a suggested donation of $5. 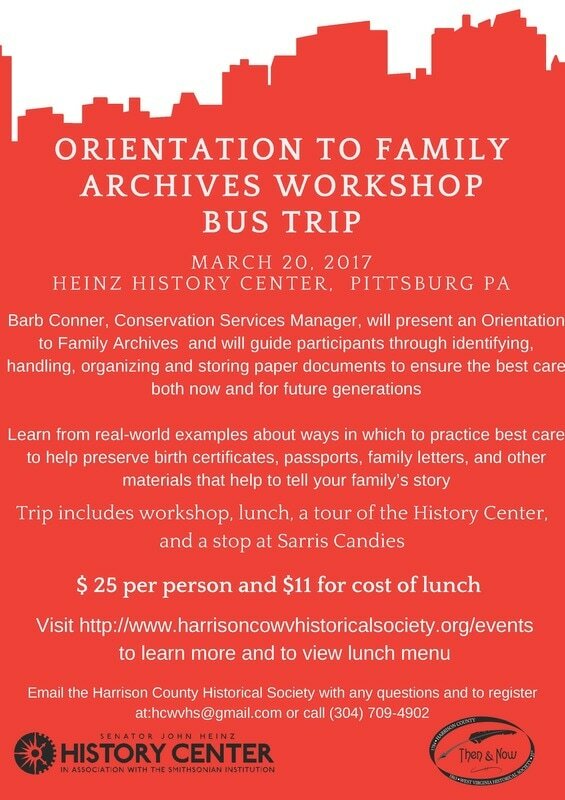 Join Waldomore and the Harrison County WV Historical Society are hosting a free workshop about preserving your family photos and scrapbooks. In this workshop we will give you the resources and information needed to properly store, handle, and deal with most situations that can cause harm your family photos. Celebrate West Virginia Day with Lost Creek Farm and the Harrison County WV Historical Society! On June 20, Chef Mike Costello and Amy Dawson of Lost Creek Farm will prepare a special six-course popup dinner featuring traditional foodways of north-central West Virginia. The event will start a 6 with a social hour and dinner starting at 7 p.m. at the Progressive Women's Association banquet hall in downtown Clarksburg. Through their traveling kitchen based in southern Harrison County, Costello and Dawson share a creative take on Appalachian food in locales across the eastern U.S. Lost Creek Farm's regionally-inspired menus include heritage foods such as charcuterie handed down in local immigrant communities, wild harvested ingredients, and a variety of heirloom crops grown on their 180 acre farm. Their work to create a regionally distinctive culinary experience was recently featured on Anthony Bourdain: Parts Unknown. Check out at news clip HERE. The wait is over!!! Join us in paying tribute to our past and present veterans by participating in the second Harrison Heroes VeteRUN 5K on Saturday, May 19, 2018 at the Clarksburg City Park in Nutter Fort. Registration kicks off at 8:00 a.m. and the race will begin at 9:00. Also, there will be a Kids 1K at 10:00 followed by an awards ceremony and reception. In addition to honoring our fallen soldiers, we are also giving back to today's veterans by donating a portion of our proceeds to the Louis A. Johnson VA Hospital in Clarksburg, WV. Our donation will go towards funding the recreation therapy program. ​Join the Harrison County WV Historical Society and the Historic Clarksburg WV Cemetery Preservation Alliance as they partner in a cemetery cleanup at the Former I.O.O.F Cemetery in downtown Clarksburg from 9:30 am - 2:30 pm on April 21st. Volunteers will be led by Historical Society AmeriCorps member Sydney Stapleton on how to properly clean historic gravestones using D-2, a solution created and used by the National Parks Service to clean national monuments. Volunteers will also work to reset fallen headstones throughout the cemetery. Click HERE to see the event covered by WDTV. ​​You are cordially invited to attend our Christmas Party on Saturday, December 9th from 12:00 - 2:00 p.m. at the Progressive Women's Association Building at 305 Washington Ave. Clarksburg. Come and visit with our other volunteers and staff and celebrate our accomplishments for the year. There will be door prizes, raffles, seasonal treats, and more! So, join us for an afternoon of food and fellowship as we celebrate the holiday season!!! ​Join us for our 2nd Annual "Spooky Tales on the Rail Trails"! For a Spooky fun time, meet us on October 6th for an evening of creepy stories and a stroll along the Harrison South Rail-Trail! We will meet at the Rail-Trail head by the Ball Field entrance at the Veteran's Administration Park. On September 21s historical society partnered up with Dominion Energy and Thrasher Engineering to clean and rehabilitate the Ross Cemetery located near the White Oaks Development in Bridgeport. The Historical Society received a grant from Dominion Energy to purchase items such as fencing, signage, and D2, a cleaner created by the National Parks service to clean monuments and gravestones. With the help of volunteers, we were able to rake away leaves and clear brush, place fencing, and clean three gravestones and multiple footstones. Markers were also placed on unmarked graves in the cemetery. We are grateful to partner with businesses to ensure the preservation of local historical sites. This one-day workshop is based on the hands-on approach with the goal of participants learning skills needed to rehabilitate a historic wooden window to Class II status - Stabilization, according to the National Park Service’s Preservation Brief # 9. Participants will learn how to make repairs on historic wooden windows in a historically-correct, safe, and timely manner per National Park Service standards. This workshop will include a hands-on demonstration in which participants will learn about wood consolidates and fillers, how to remove and install window sashes, how to safely remove paint and glass, how to cut glass, the re-roping process, and how to prime, glaze, and paint a historic wooden window. Participants will also learn how to do an evaluation of a window and about hazardous materials found in the home. Anna Lynn Stasick, PAWV’s statewide field services representative, will lead the workshop. Stasick has led workshops of this manner for over 7 years, has over 20 years of contracting experience, and has rehabilitated dozens of historic wooden windows. Join the Harrison County WV Historical Society in welcoming trained oral historian Eliza Newland in a hands-on workshop to learn the tips and tricks for collecting and maintaining your families stories. Eliza will share tips for interviewing family members to collect their stories and will have activities for participants to get hands-on experience in interviewing. We will also explore the pros and cons of different ways of preserving stories. A $10 donation is suggested. So join us July 29th from 10 am to 12 pm at the newly renovated Waldomore at 404 W Pike St, Clarksburg. 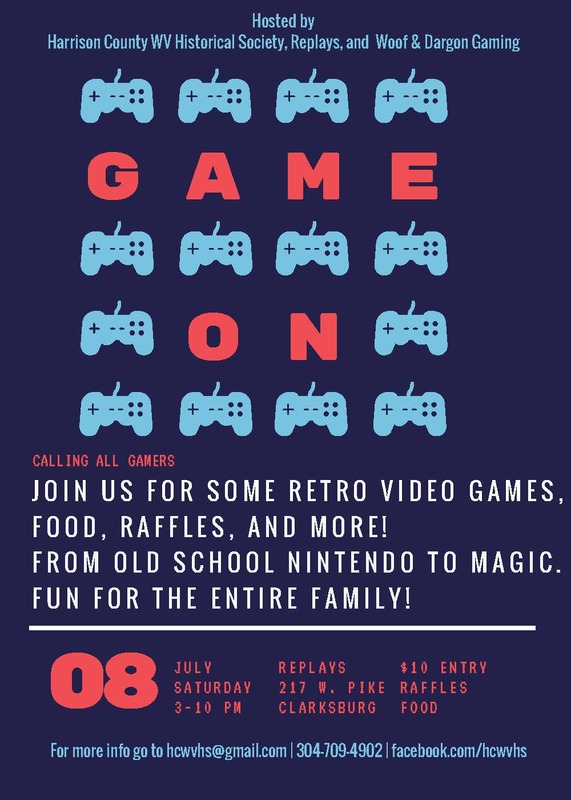 Come on out to Replays in downtown Clarksburg for Game Night presented by the Harrison County WV Historical Society, Replays, and Woof & Dargon Gaming. For $10 you can play all day! There will be vintage games like old school Mario, card games like Magic: The Gathering, and board games as well. Fun for the entire family with all game levels. There will be raffles, food for sale, and more. So come on down anytime July 8th from 3-10 on at Replays 217 West Pike St. Clarksburg. Come join the Harrison County WV Historical Society for an afternoon of fun and win one of our Vera Bradley gift prizes on Saturday, June 11th at the VFW in Clarksburg. $20 for 20 games. We will also have raffles, 50/50, and more! You'll also be able to purchase refreshments. Starts at 2 with doors opening at 1. Proceeds will go toward our archival supplied and house repairs. You may order tickets by emailing us at hcwvhs@gmail.com or by calling 304-709-4902. You are invited to the Harrison County Historical Society's open meeting with special guest Merle Cole. 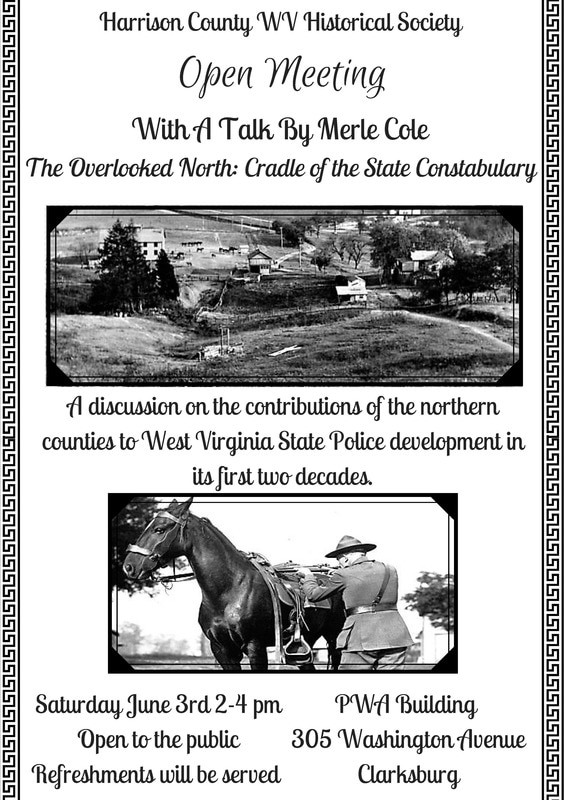 His talk, tilted “The Overlooked North: Cradle of the State Constabulary”, will speak on the contributions of the northern counties to West Virginia State Police development in its first two decades. The meeting will be held Saturday, June 3rd, 2-4 pm at the PWA Building, 305 Washington Avenue Clarksburg. Free to the public and refreshments will be served. Please email us at hcwvhs@gmail.com or call 304-709-4902 with any questions. On May 26, 2017, those interested in learning about the care, management, and preservation of rare and old books are invited to attend a workshop at the WVU Rare Book Room in the West Virginia & Regional History Center. This workshop is part of the West Virginia Association of Museum’s 2017 educational workshop series. Stewart Plein and Crystal Wimer will share their expertise and demonstrate hand-on preservation methods for the conservation and care of old and rare books. The workshop will begin with a tour of the Rare Book Room where preservation and conservation issues of old books will be discussed. The second half of the workshop will be hands-on where participants will learn how to preserve their collection’s fragile books with step by-step instruction in constructing a phase box. Phase boxes are archival boxes that protect fragile or valuable volumes. Books, preservation supplies, and handouts will be provided. Participants are welcome to bring their own old book from their collection that would benefit from the protection of a phase box. The workshop will begin in the Rare Book Room at the West Virginia Regional and History Center on Friday, May 26, and last from 10 am to 2 pm. The cost for this workshop is $15 for WVAM members or $25 for non-members. Lunch is included. To honor the 100th Anniversary of the birth of Senator Robert C. Byrd in 2017, the Robert C. Byrd Center for Congressional History & Education has designed a major traveling exhibit, “Robert C. Byrd: Senator, Statesman, West Virginian.” ​The exhibit features digital representations of more than 100 documents and photographs from the extensive Robert C. Byrd Congressional Papers Collection. The Harrison County Historical Society and the Auxilary UHC will be partnering on the showing of the exhibit here in Harrison County from April 12th - May 15th on the first floor of at the United Hospital Center. 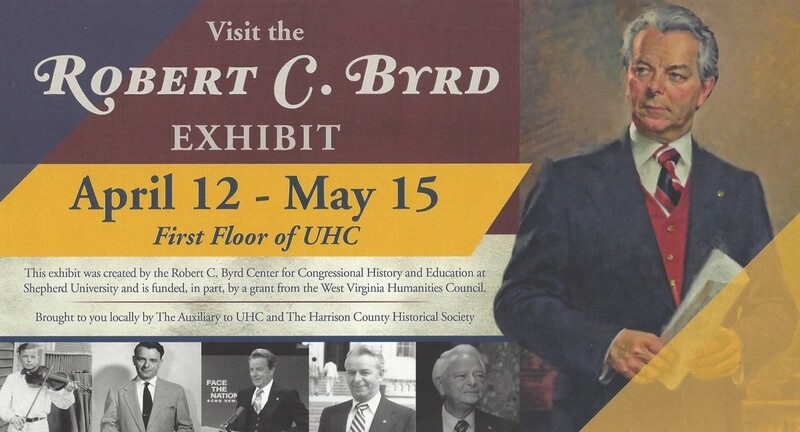 The exhibit, which debuted at Shepherd University in April 2016, will tour the state of West Virginia over the next two years, culminating in a celebration of Senator Byrd's 100th birthday in November 2017 in the state capitol, Charleston. Harrison County Historical Society Easter Egg Hunt Eggstravaganza! We have a fun event coming for all of the kids out there! We will be holding a county-wide Easter Egg hunt Eggstravaganza! On Monday, April 10th we will be placing Easter eggs filled with Harrison County history facts (and of course candy) in parks across the county and at the Stealey-Goff-Vance House. There will also be one golden egg with a ticket for a Toys"R" Us gift card! 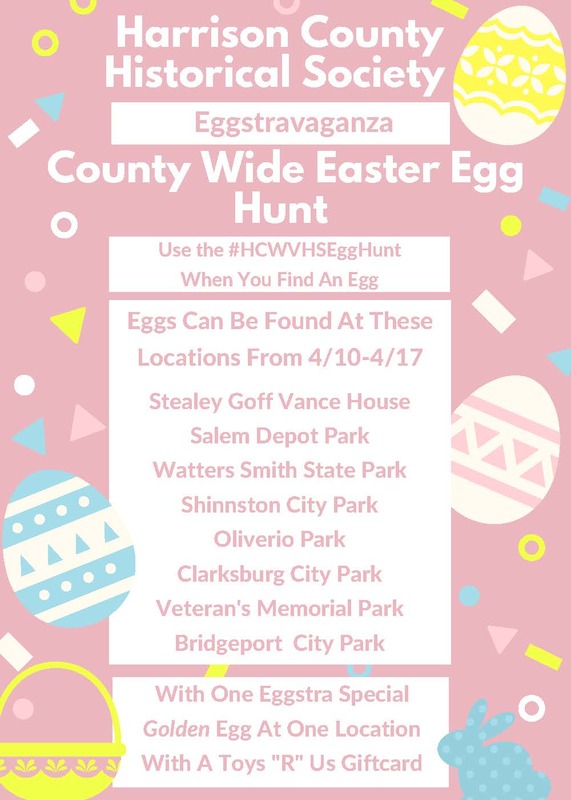 Post photos and use the #HCWVHSEggHunt to show off your goodies! Learn from real-world examples about ways in which to practice best care to help preserve birth certificates, passports, family letters, and other materials that help to tell your family’s story. Join the Harrison County Historical Society in a celebration of Black History Month on February 15th. 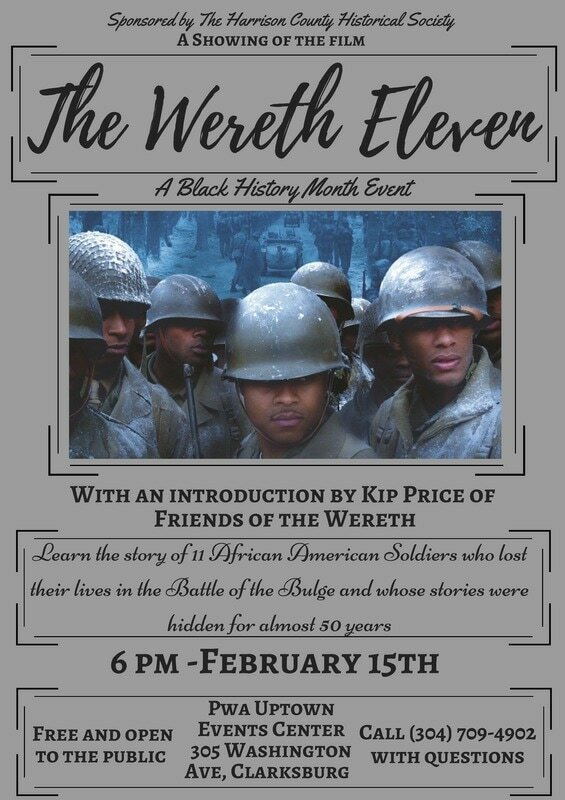 We will be showing The Wereth 11, a film about a group of African American soldiers who were massacred in the Battle of the Bulge during World War II and whose deaths were hidden for almost 50 years. There will be an introduction by Kip Price, a member of the friends of Wereth group. The event starts at 6 pm at the Progressive Women's Association Uptown Events Center at 305 Washington Ave, Clarksburg. The event is free to the public. So come down a celebrate black history! 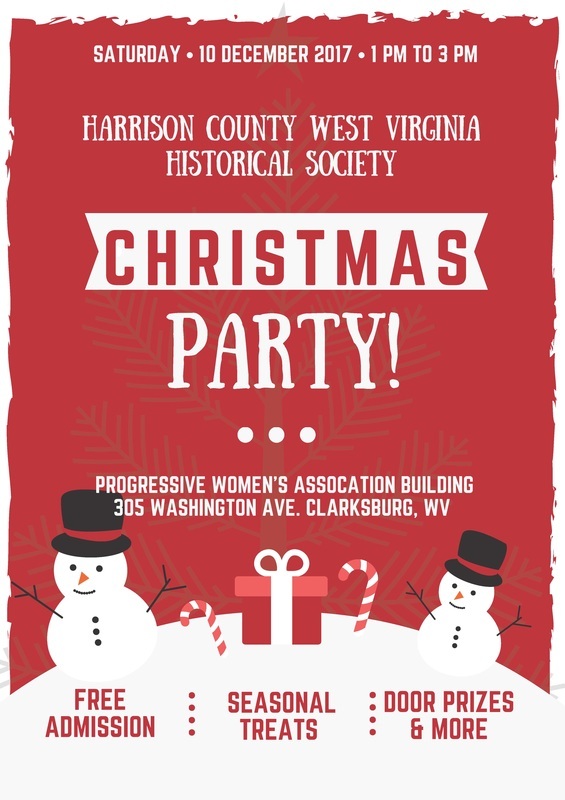 ​You are cordially invited to attend our Christmas Party on Saturday, December 10 from 1:00 - 3:00 p.m. at the Progressive Women's Association Building (305 Washington Ave.) in Clarksburg. Come and visit with our other volunteers and staff and celebrate our accomplishments for the year. There will be several door prize drawings, raffles, and we will recognize our dedicated volunteers. So, join us for an afternoon of food and fellowship as we celebrate the holiday season!!! Join us on the North View Rail Trail October 21 for evening of creepy local stories. The walking tours begin at 6:00 and 8:00 PM at the North View trailhead (North 25th Street, Clarksburg). Wear your favorite costume, and make sure to stay after the tour for some seasonal treats!!! We ask that you arrive 15 minutes before the tour. The event is sponsored by Harrison Rail Trails and the Harrison County WV Historical Society. 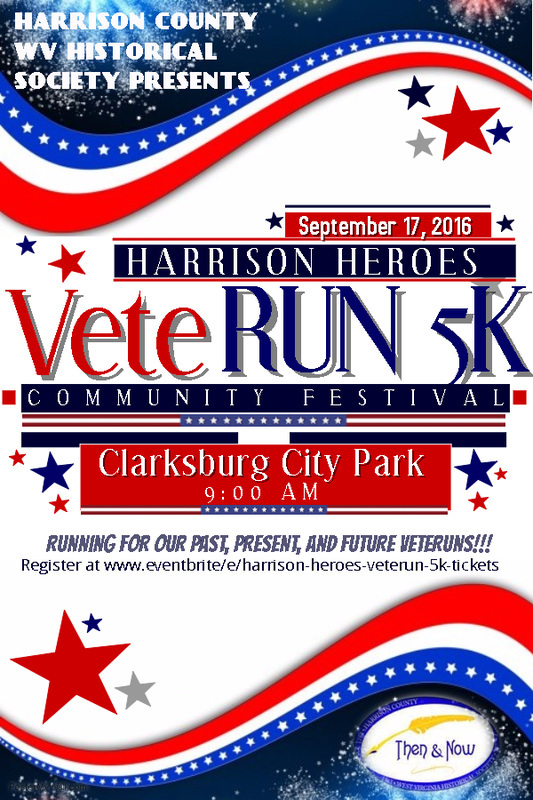 Please mark your calendars for the Harrison Heroes VeteRUN 5K on Saturday, September 17, 2016, beginning at 9:00 a.m.
Help the Harrison County WV Historical Society pay tribute to our past and present veterans by participating in the first Harrison Heroes VeteRUN 5K. At the Clarksburg City Park at Nutter Fort on Saturday, September 17, participants will run in remembrance of our fallen warriors. We are also giving back to today's veterans by donating a portion of our proceeds to the Louis A. Johnson VA Hospital in Clarksburg, WV. Our donation will go towards funding the recreation therapy program. 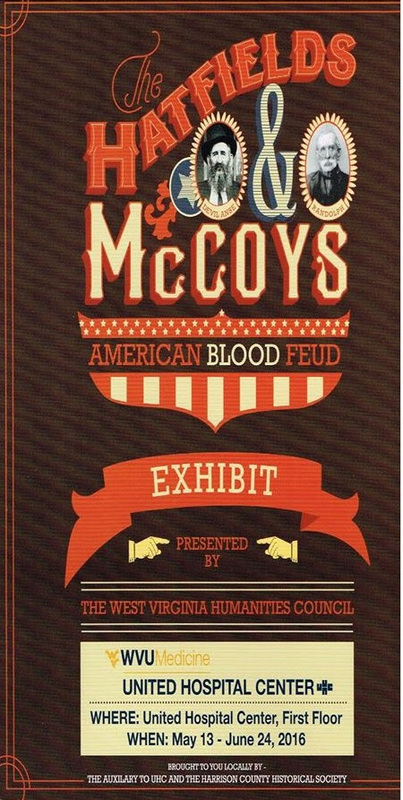 ​We are pleased to announce the opening of The Hatfields and McCoys: American Blood Feud exhibit at United Hospital Center on Friday, May 13. ​Presented by the WV Humanities Council, the exhibit is co-sponsored locally by the HCWVHS and the Auxiliary to UHC. It runs from May 13-June 24 and will be located on the first floor of the hospital. The Harrison County Historical Society will opened an exhibit to honor Harrison County’s contributions to American military conflicts “IN REMEMBRANCE”, Friday, September 25th at 12 noon to 1pm. With the assistance of Olymbec, USA, Clarksburg, the Historical Society has arranged to bring together photographs, newspaper accounts, letters and diaries of the men and women from Harrison County who served their country in times of war and peace beginning with the Civil War through today’s conflicts. The Historical Society found in their archival collections accounts from the Civil War, The Spanish American War, and World Wars’ One and Two. 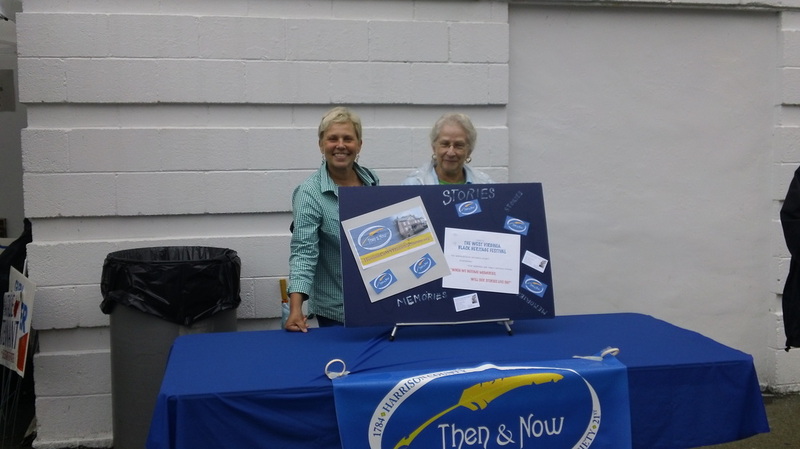 Further contributions of information and ephemera from local families and research, enabled the Society to bring together a very comprehensive reflection of the conflicts involving the citizens of Harrison County and the immediate area. Anniversaries of several of the conflicts, Civil War-1865; World War II- 1945; and Vietnam Resolution- 1975 opened up the reason for the exhibit. The Historical Society is pleased to join with co-operation of Olymbec, USA in the display of the objects in the lobby of the Chase Building on Third Street in downtown Clarksburg. The exhibit “In Remembrance” will open at noon on September 25th with a reception to dedicate the exhibit to the citizens of Harrison County. 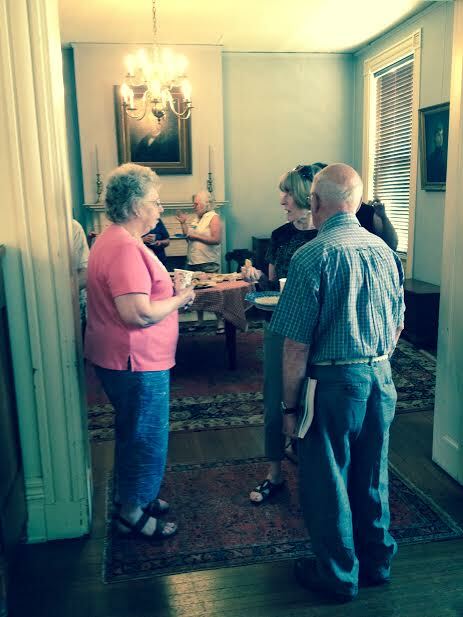 The Historical Society had a great and well attended presentation by authors Martha and Richard Hartley of Ritchie Co. at the Waldomore. Their book, "The Frontier Table" is a great and well documented history of the "foodways" of North-Central West Virginia, 1776-1860. 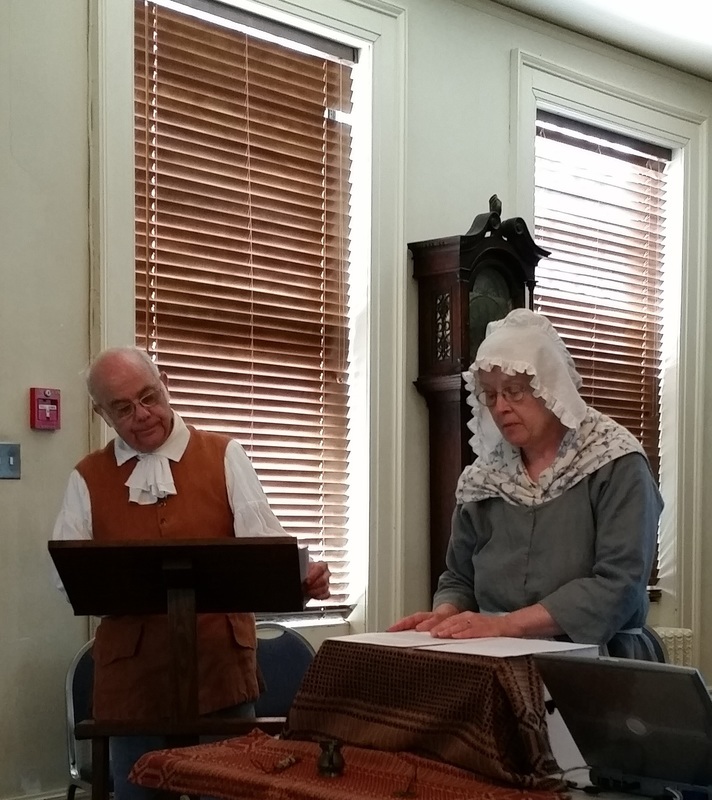 The Hartleys, in traditional clothing of early 1800, offered a great PowerPoint presentation and discussion of food traditions in the Harrison County area. Food made from early recipes in their upcoming book was served after the presentation. "The Frontier Table" is available at James & Law. The authors used letters, diaries, and traditions of the early days of sustainability in the early settlement years, through the advent of the Civil War. The next book in the Hartley's series will contain recipes, eating habits and agricultural development from the first attempts at raising foods then to the farms that produced what each family needed for year round needs. 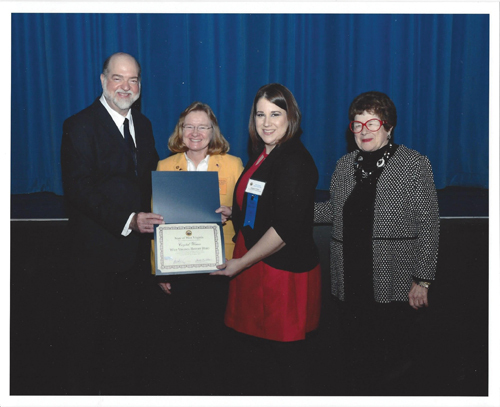 The West Virginia Association of Museums and the Harrison County Historical Society will jointly sponsor and present an all day workshop entitled, "Building A Small History Exhibit". 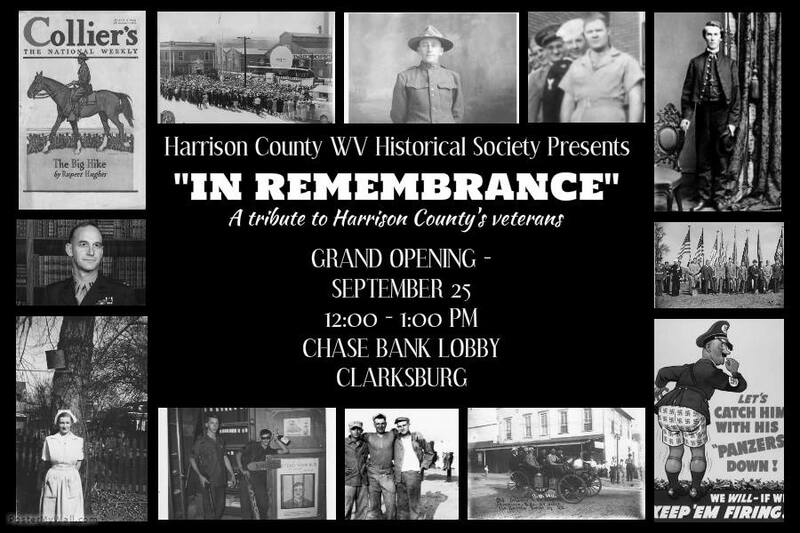 The event will be held Monday, October 13, 2014, from 9:00 am to 3:00 pm at the historic Waldomore in downtown Clarksburg, Harrison County. Objects, documentation source materials and computers will be provided to design, write an exhibit title, an explanatory main text, several section texts, individual captions and a press release for the exhibit. Objects to be used in demonstration will include glass made by several glass factories, a pottery , and an iron foundry in Paden City, West Virginia. Although the workshop is free to members of the WV Association of Museums and the Harrison County Historical Society, non members will pay a $15.00 fee. 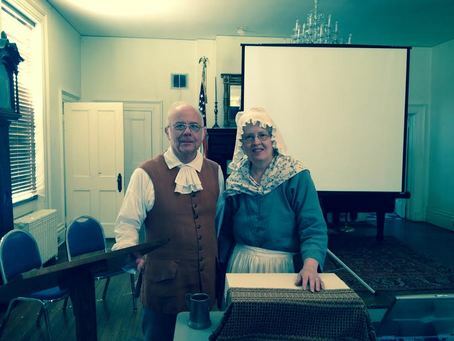 The presenters will be James Mitchell and Carol Schweiker. 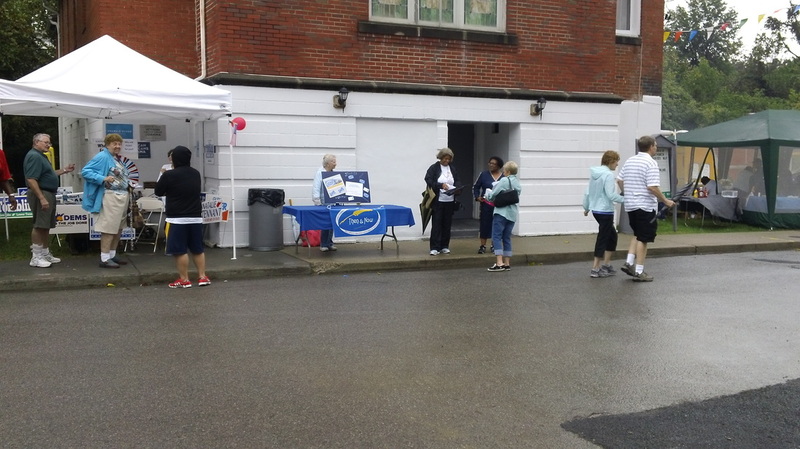 Here is a picture of our booth from the Italian Heritage Festival held over Labor Day weekend 2013. This is the display of family photos and sketches we have received to date. Represented are the Bonasso, Merandi, and Barillaro families. We are continuing to ask your support in moving this project forward. We would like to have your family story. Our links to the past continue to leave us and are then silent forever. You may think that what little you have now may not be important or of little interest but that little can mean a lot to the next generations. 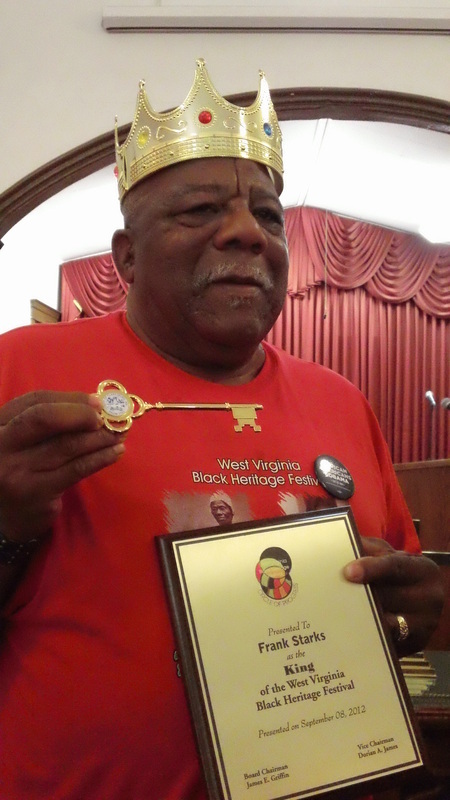 The 22nd Annual Black Heritage Festival was honored in 2013 with the crowning of King Frank Starks of Meadowbrook, WV, and Queen Naomi Butler of Morgantown, WV. 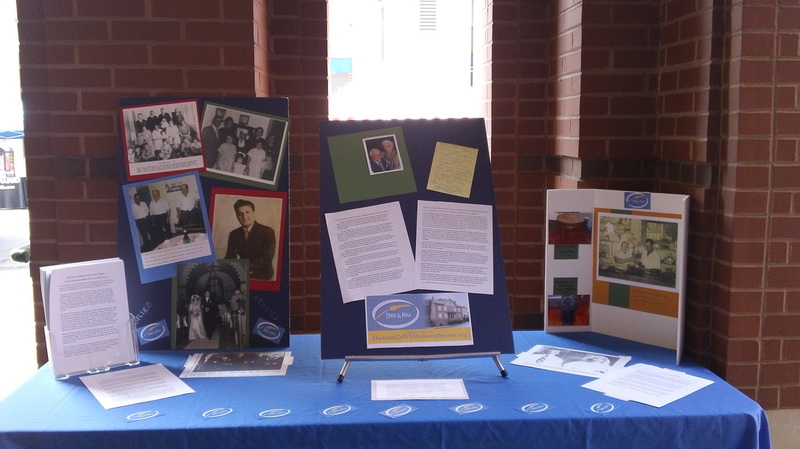 The Harrison County WV Historical Society was there to introduce our memories project. We are hoping many will join in our effort to collect stories from all backgrounds.